“WHAT DO you mean it doesn’t translate? !” I remember saying to the TV – complete with hand gestures and a raised voice – when the Indian Chef Maya Kaimal was explaining to THE Martha Stewart that her Spinach Thoren dish doesn’t have an exact equivalent English name. She was talking about the “thoren” part, obviously. She went on to describe what it means, in length, but she lost me the moment the mustard seeds started popping upon hitting the heated oil. I just thought that it sounded like a demigod’s name. I got reminded of this as I attempt to blog about my recipe for “Sarciadong Alimasag.” The “alimasag” part is easy. 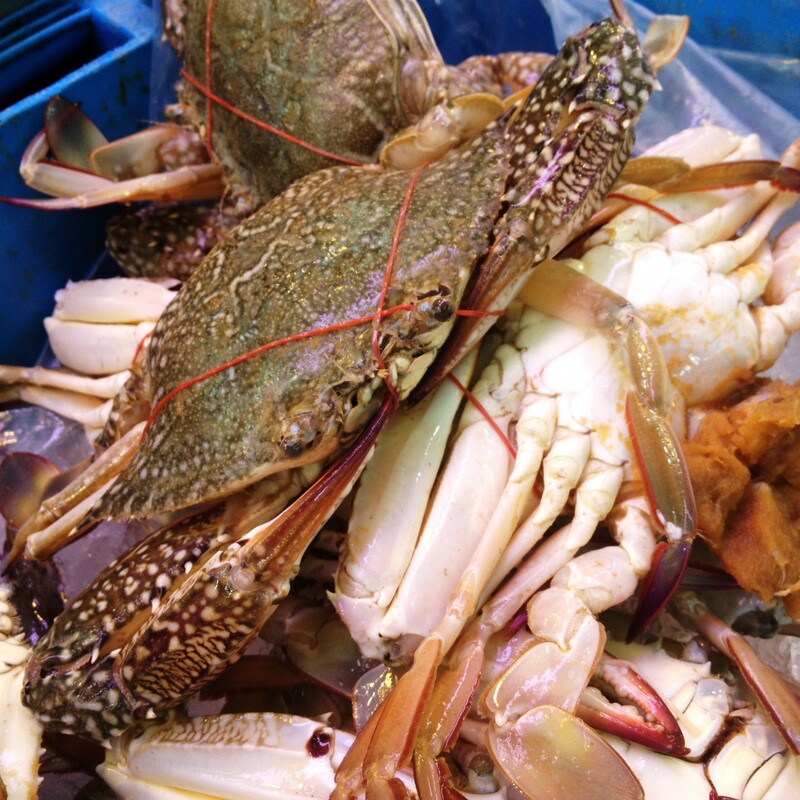 It translates to blue crab, or “flower crab,” as it is more popularly known here in Singapore. The “sarciado,” I’m not quite sure of. I consulted Google Translate, expecting that its “Detect Language” functionality would determine the provenance of the word to be Spanish. I hit the button and it turned up to be – “Portugese.” But it shares the same fate as thoren. No direct translation. “Sarciadong Alimasag” is a dish from my childhood. It is the fattest blue crabs cooked in a sauce made by sautéing finely minced root aromatics garlic and onions with lots of finely chopped fresh tomatoes. The salty savory quality to the dish is achieved by adding soy sauce. 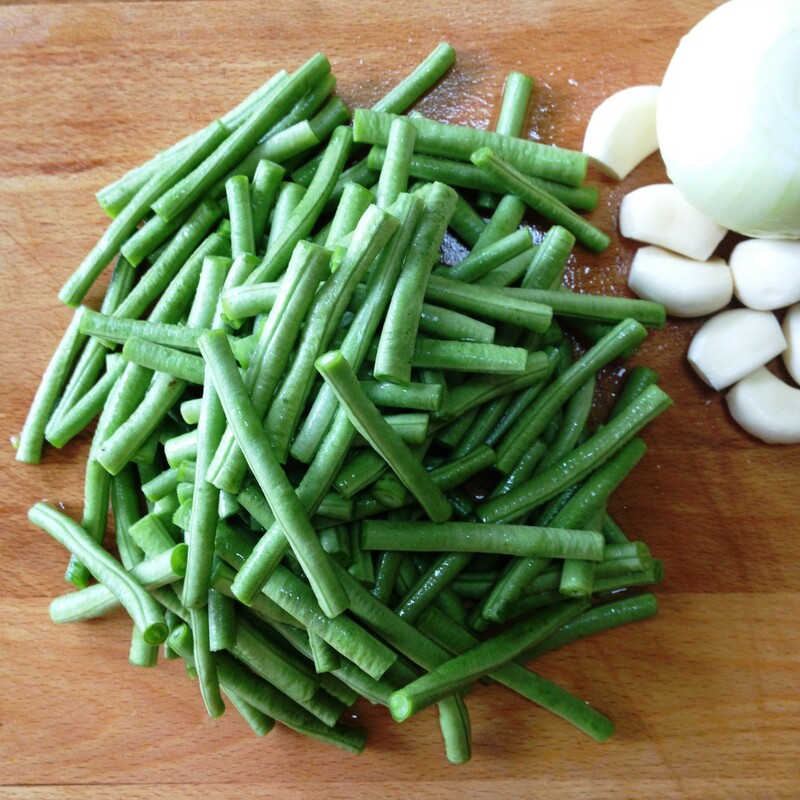 For balance – of texture and nutrients, I suppose – string beans are added. 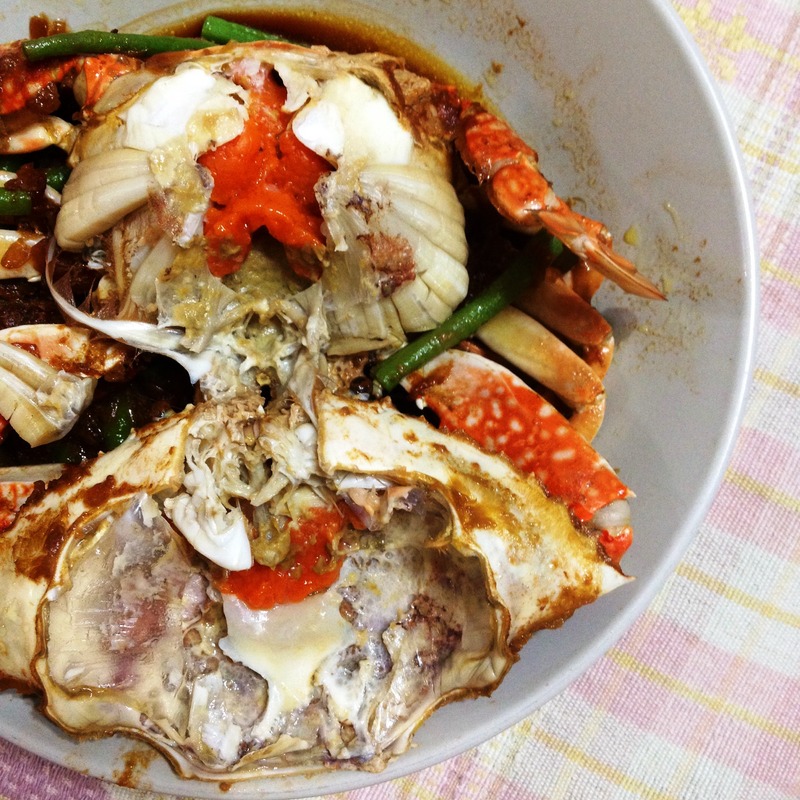 The secret to this dish is using the freshest flower crabs possible. Here in Singapore, I’ve bought these from the lowest end to the highest end of groceries, both ending in much disappointment. The crabs – though female – were bereft of the prized roe and worse, frozen to the point that reduces the meat to a pulp. That is, if you’d be lucky enough to find any meat at all. 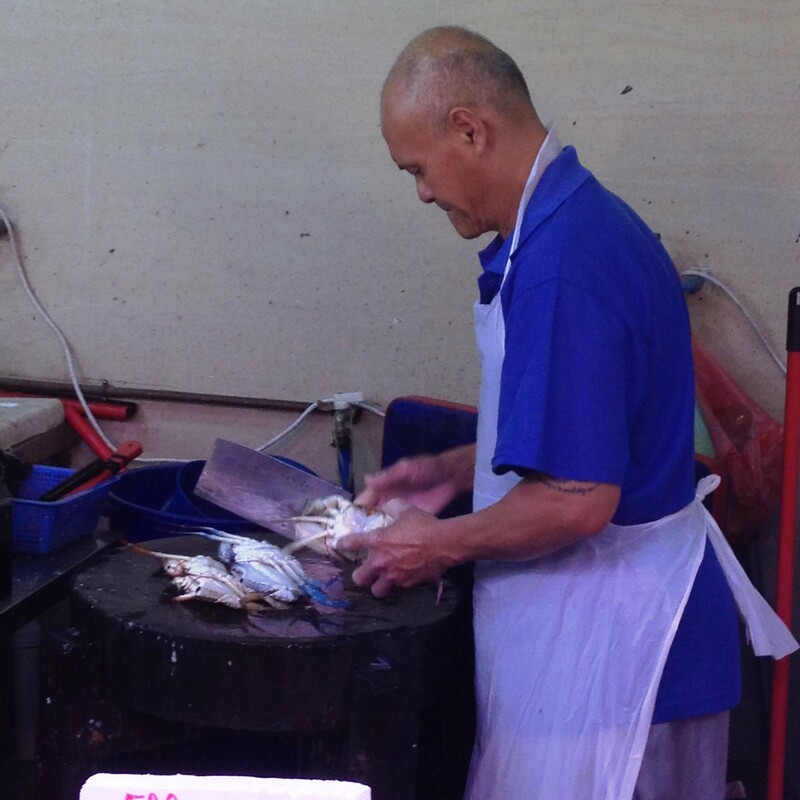 So I did what any self–respecting culinarian does, get up at the crack of dawn and head to the nearest wet market where wild–caught seafood could be had, fresh from the shores. They may be iced in transit but never frozen. 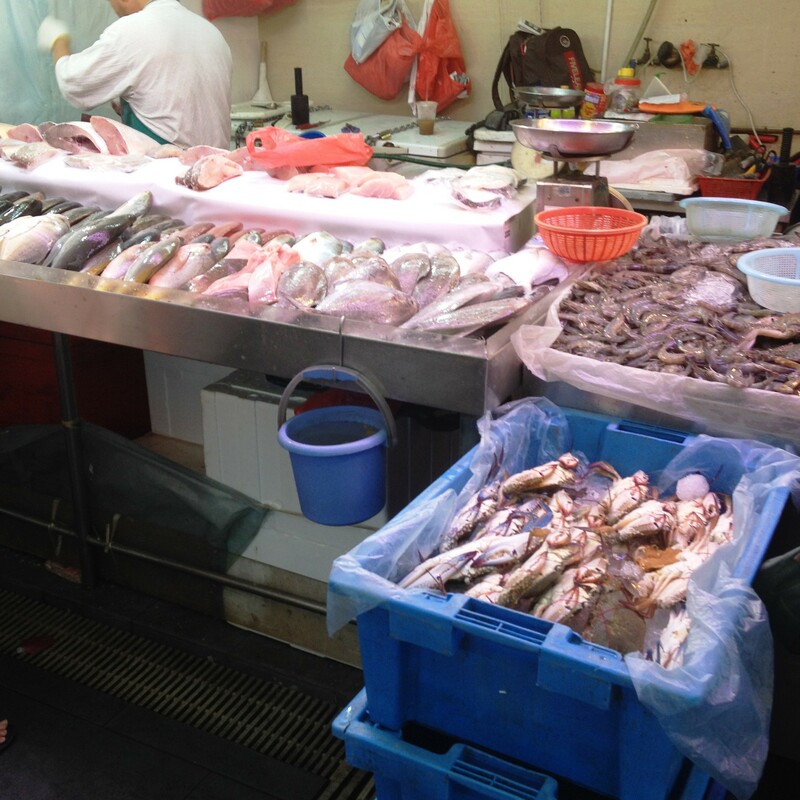 The only stall at the market that sells flower crabs! 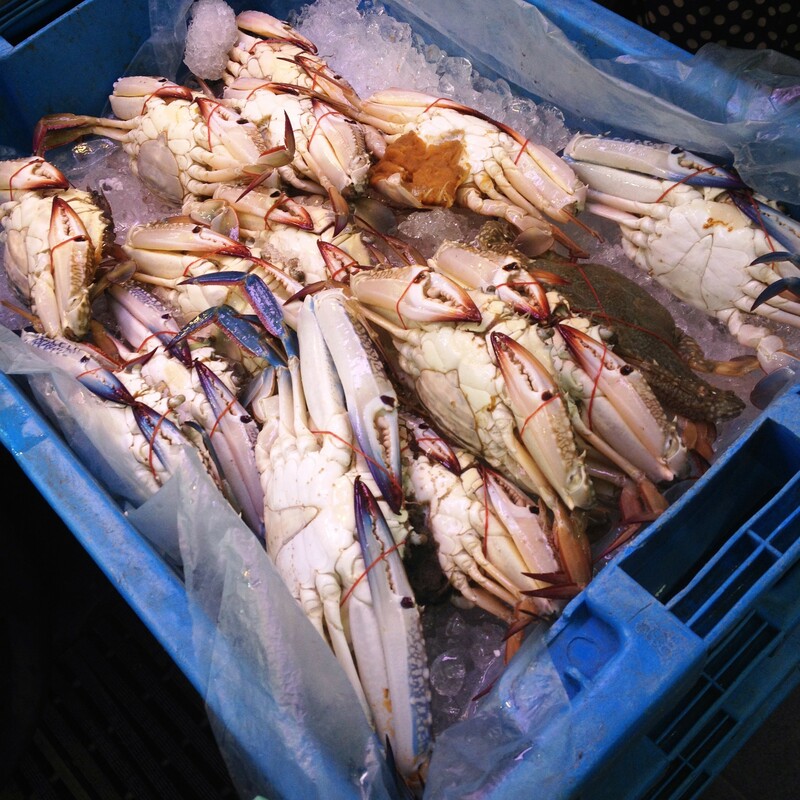 The blue crates hold these blue crabs (blue for blue… it matches!). A total of five, each with a couple or three layers of crabs. By the time I got there, there was only one crate left, with only one layer! My luck! This flower crab was ready for its close-up. And my purchase. There was a mad rush for the flower crabs, and understandably so. All the Aunties and Uncles who were buying would ask for their purchases to be prepped. But for me, I do it by myself. Today, I may have woken up to the opening strains of Maroon 5’s “Sunday Morning,” but I’m blogging right now with The Black Eyed Peas’ “I Gotta Feeling” on heavy rotation in my head. This batch turned out to be outstanding! Here’s my recipe, kicked up a notch with the addition of a surprise twist. 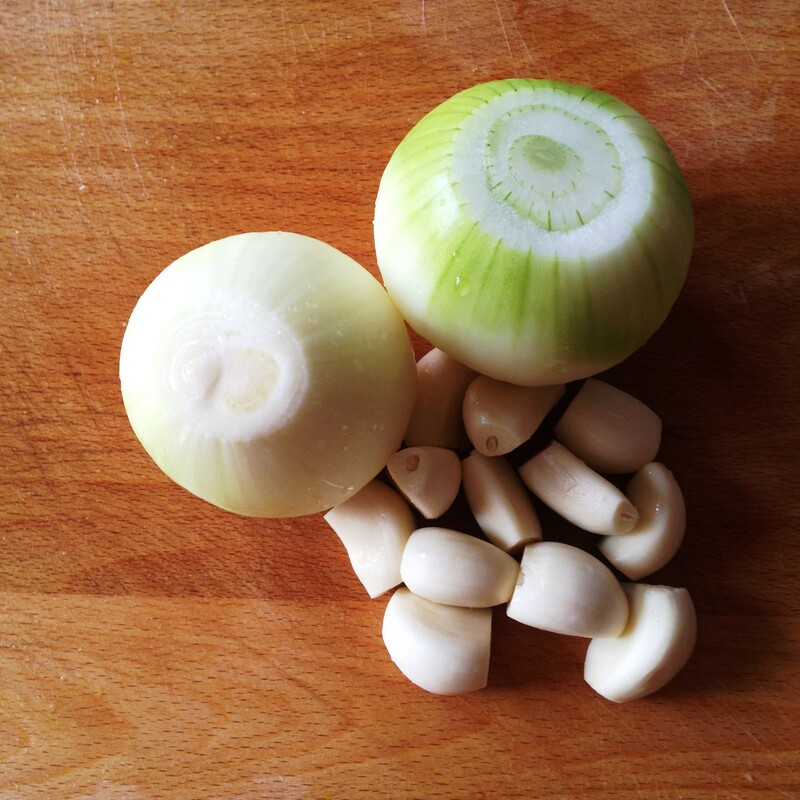 The usual root aromatics garlic (exactly 12 cloves) and onions (two medium–sized). 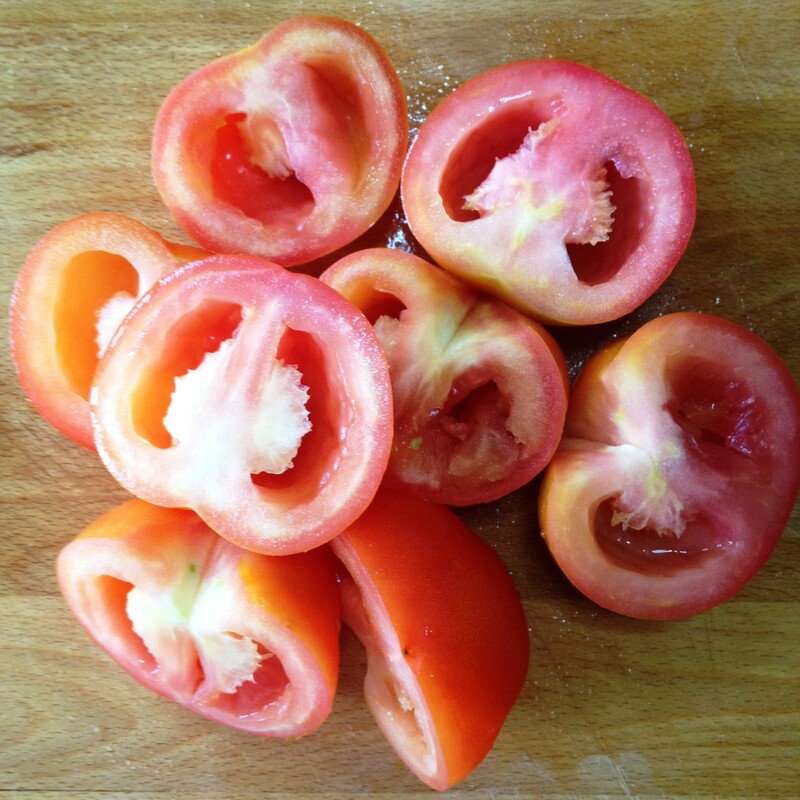 Four medium–sized tomatoes, already seeded, ready to be blanched, peeled and then finely chopped. 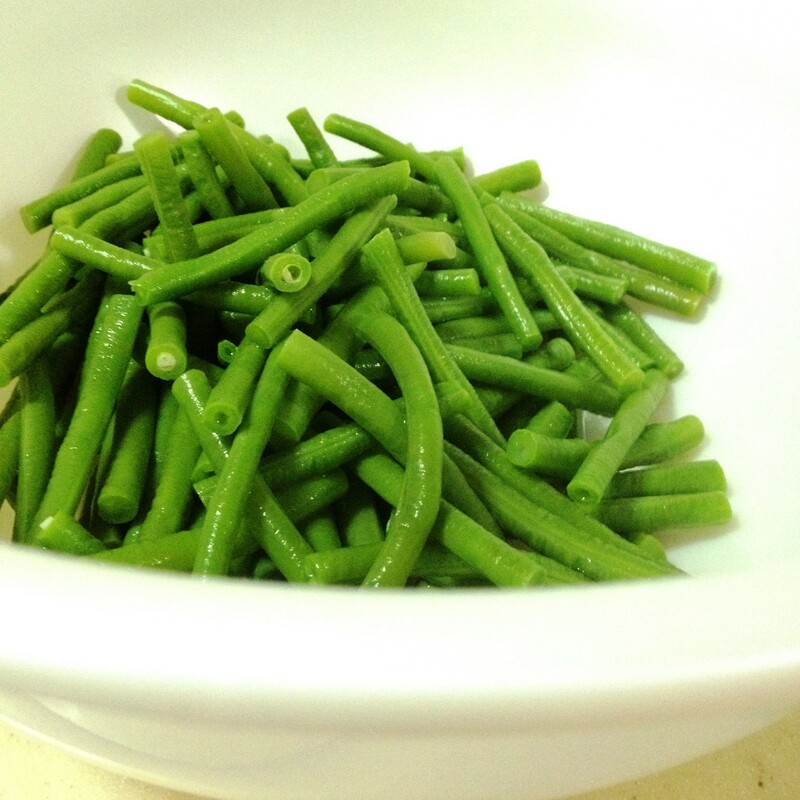 String beans (long beans), exactly 20, here already cut up into 3″ pieces. 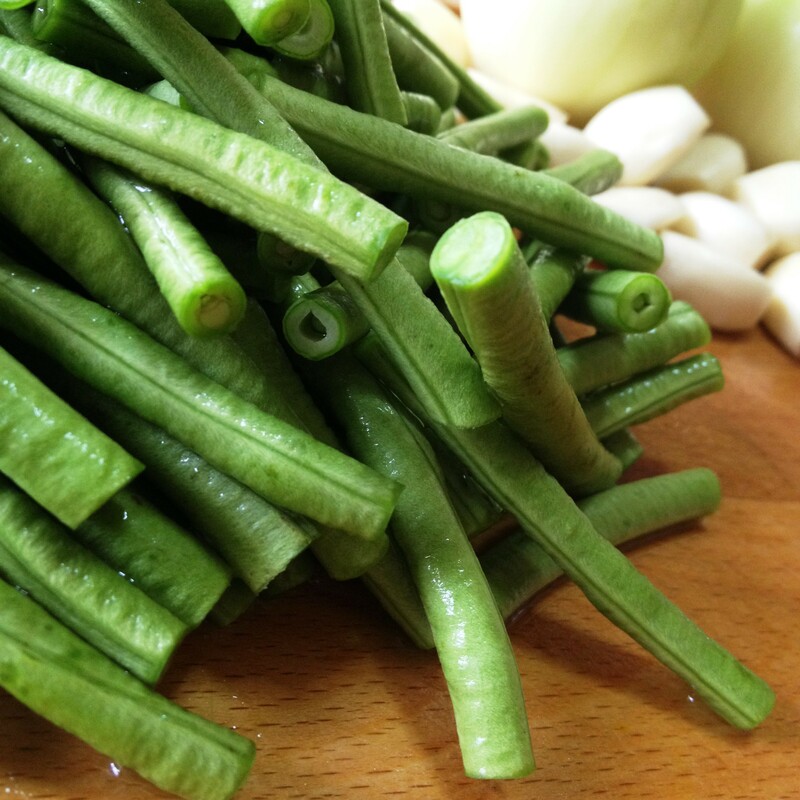 Choose string beans (long beans) that are as thin as could be. Reed-thin. The onions and tomatoes already prepped. Both should be chopped as fine as possible. The garlic is saved, to be pressed fresh on top of the sauté. As a key learning from a company-sponsored cooking class I had attended, I have started blanching vegetables, as much as time would allow me, before I use them in my recipes. Heat a heavy bottom skillet over low–medium flame. I prefer to use the ones that are really wider than they are taller. Add a thin film of the Bertolli® Classico “Mild Taste” Olive Oil or any vegetable oil. In it, sauté the onions, then turn the heat low. Cover the pan to “sweat” the onions, about five minutes. 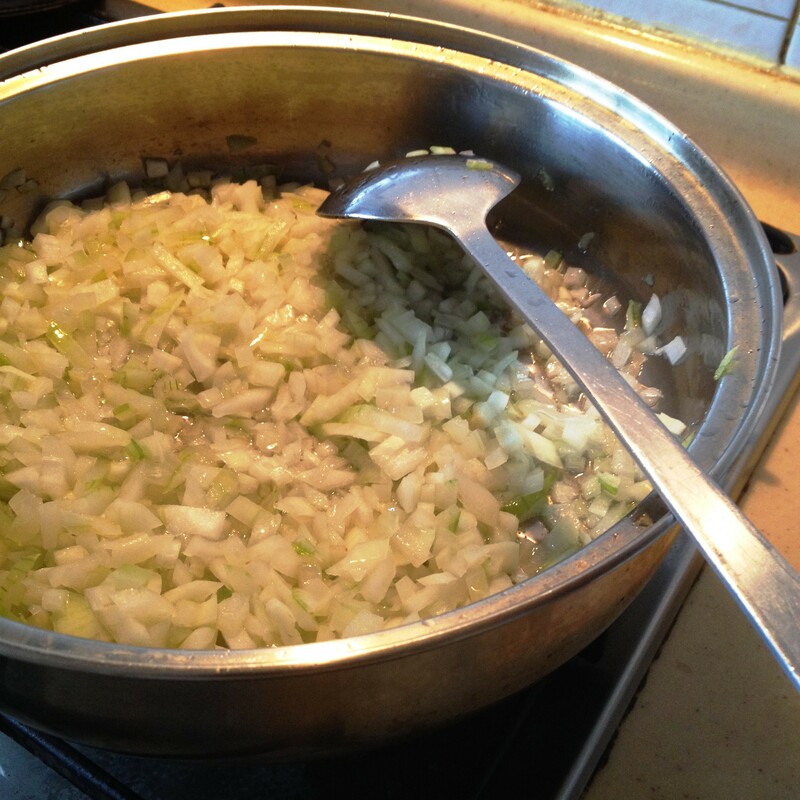 Step 1: Sauté the finely minced onions over low–medium heat. 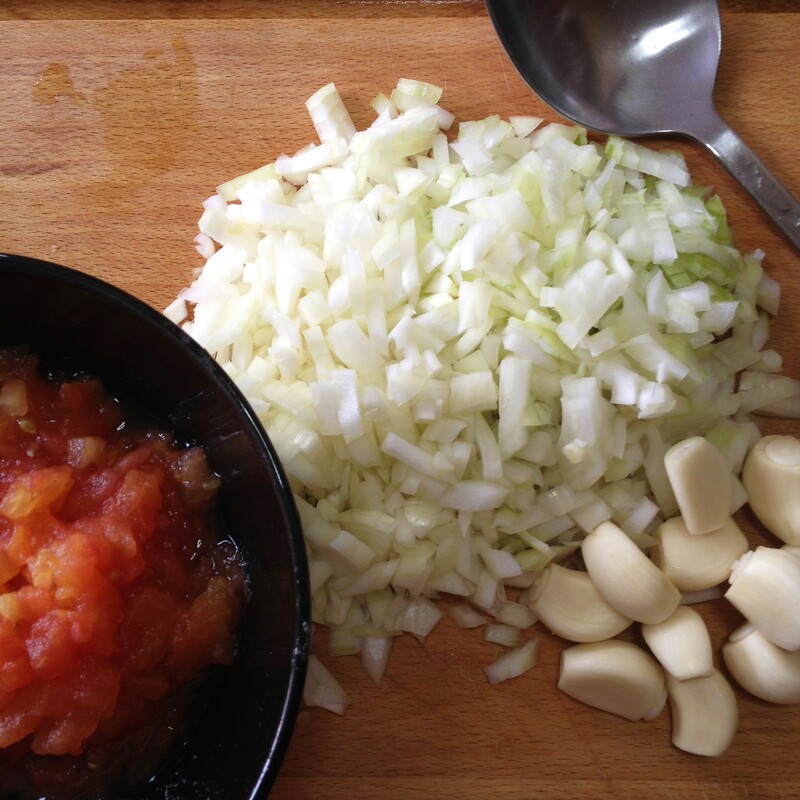 Once the onions have become soft and translucent, add the finely minced garlic. 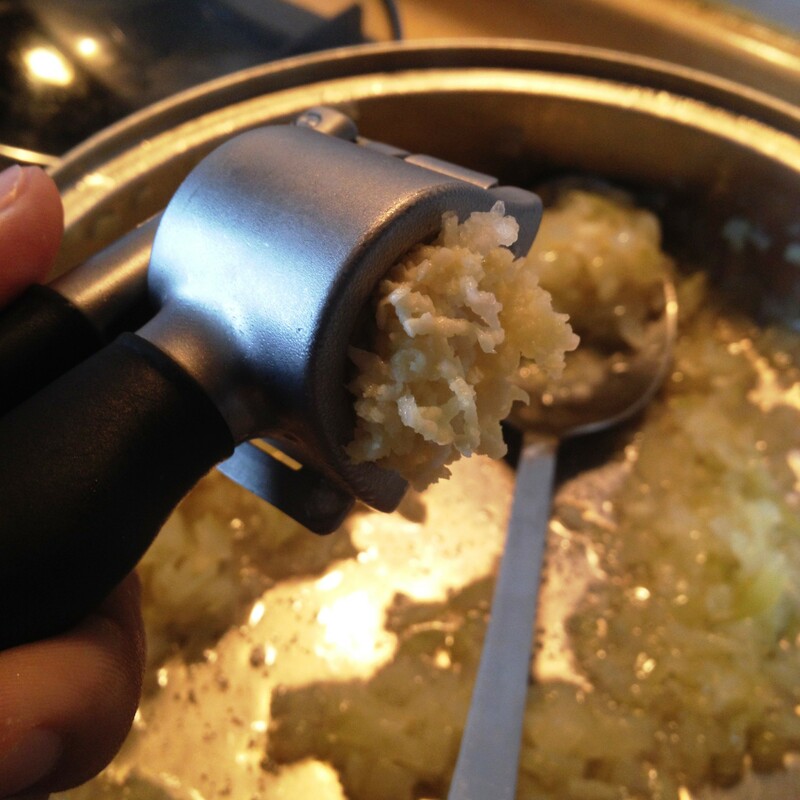 I do so by pressing the garlic right over the pan, using my handy–dandy IKEA® garlic press. Press the garlic right over the pan. 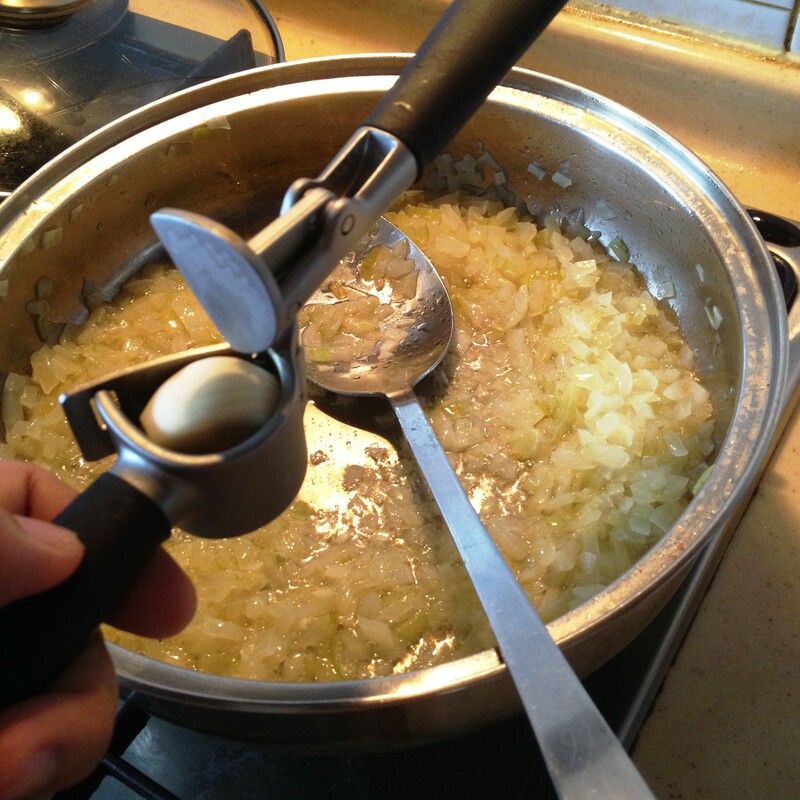 I use my handy–dandy IKEA® garlic press. Look just how perfect the garlic comes out of this press! #AWESOME! Once the garlic has (been) cooked through – I do not recommend browning the garlic at all – add the finely chopped tomatoes that had first been seeded, blanched and then peeled. 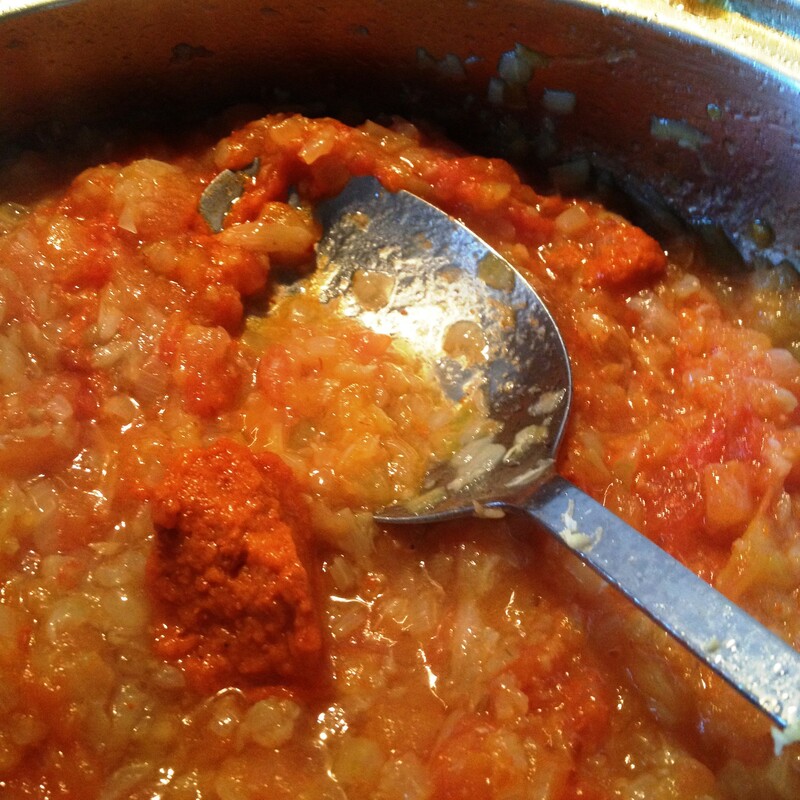 Turn the heat up to allow the tomatoes to breakdown into a sauce. 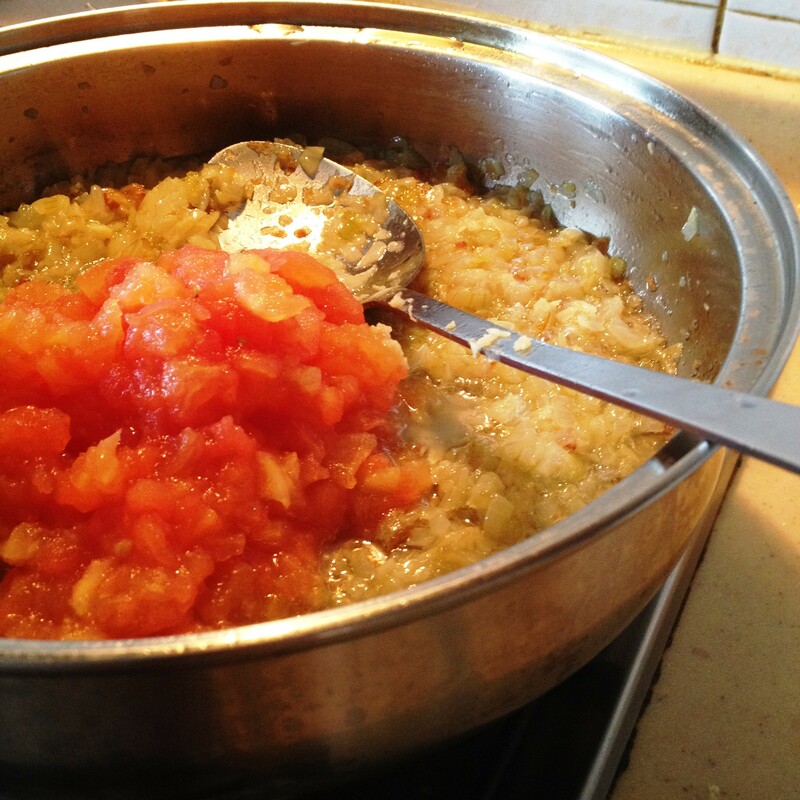 Turn the heat up to allow the tomatoes to breakdown into a sauce. After about five minutes, add The Blue Kitchen Pure Aligue. Mix it well into the sauce. This bottle of The Blue Kitchen Pure Aligue works wonders! 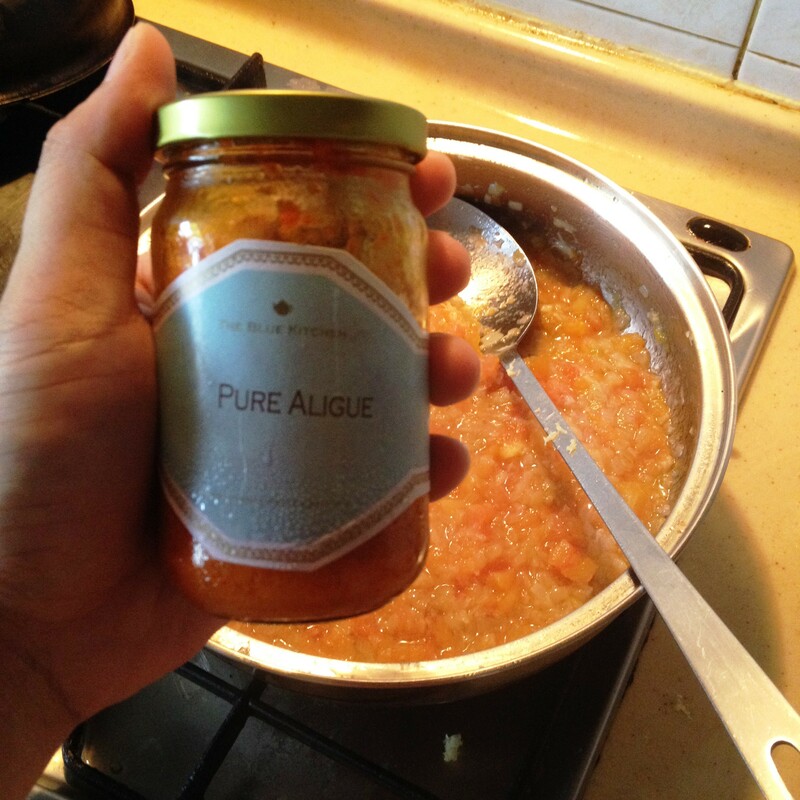 This heaping tablespoon of The Blue Kitchen Pure Aligue lends a nutty, almost buttery goodness to the sauce. Season with Woh Hup® Superior Dark Soy Sauce. Add one to four tablespoons of water, as needed. It’s time for the soy sauce! 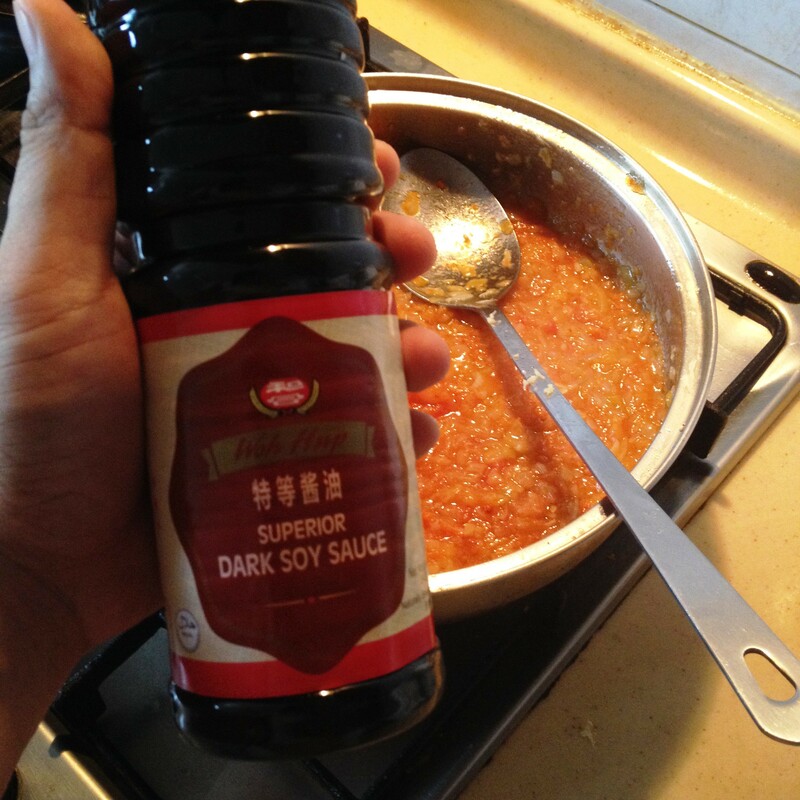 Lately, I’ve been in love with Woh Hup® Superior Dark Soy Sauce. 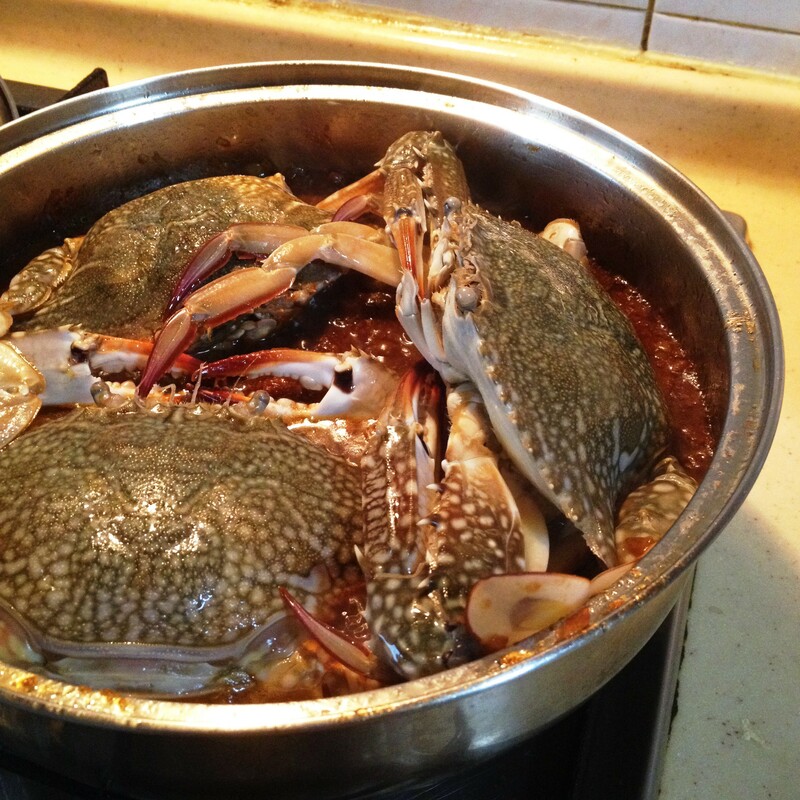 Once the mixture comes back to the bubble, arrange on it the flower crabs (blue crabs). Put the lid back on. These three flower crabs are huge that they hardly have enough room in my wide pan. My pots and pans have tempered glass lids so I can see exactly what’s going on. But if yours aren’t, check the crabs after being cooked covered for six to 10 minutes. 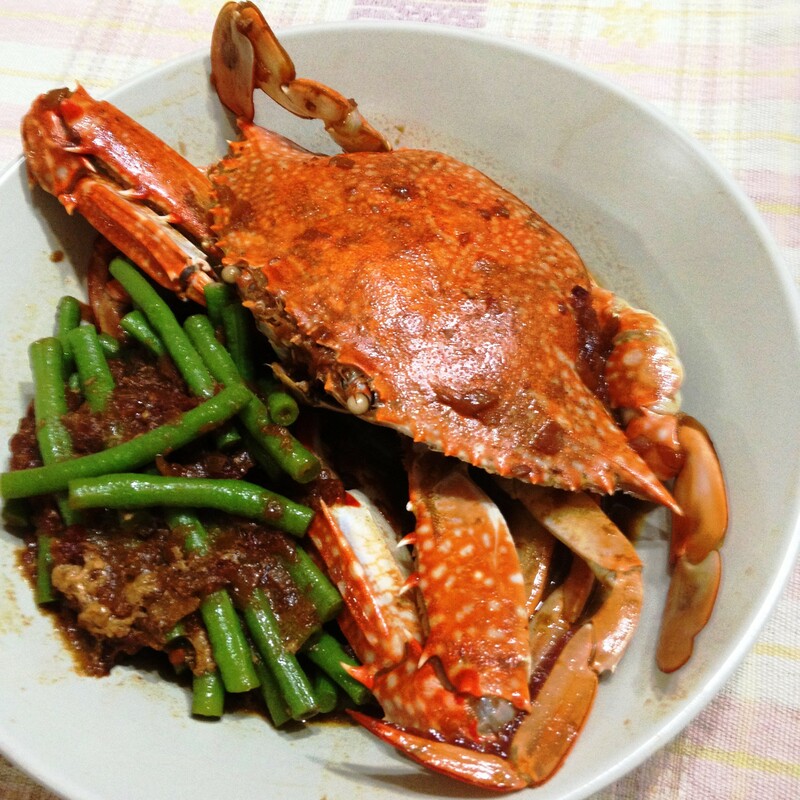 When the crabs have turned color completely, add the string beans. Three minutes after the dish has come back to the boil, turn the heat off. 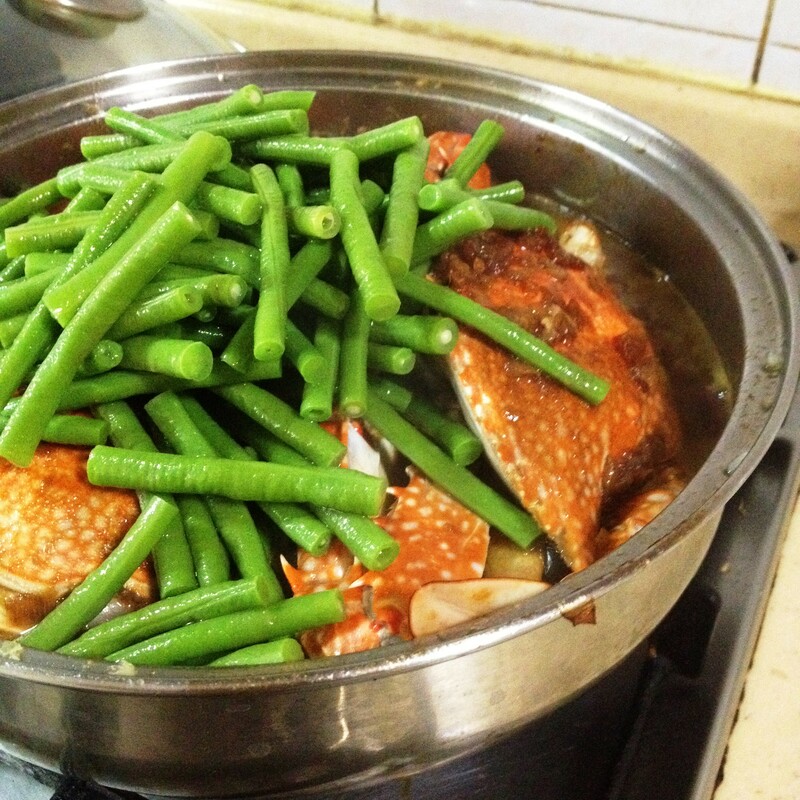 Add the string beans (long beans), this time already blanched, just when the flower crabs have completely turned color. “Sarciadong Alimasag” is ready to serve! In my case, with heaps of freshly cooked, steaming hot Japanese pearl rice. “Sarciadong Alimasag” (flower crab sarciado) is ready! Will you just look at that?!?!?! Good thing I made lots of Japanese pearl rice! 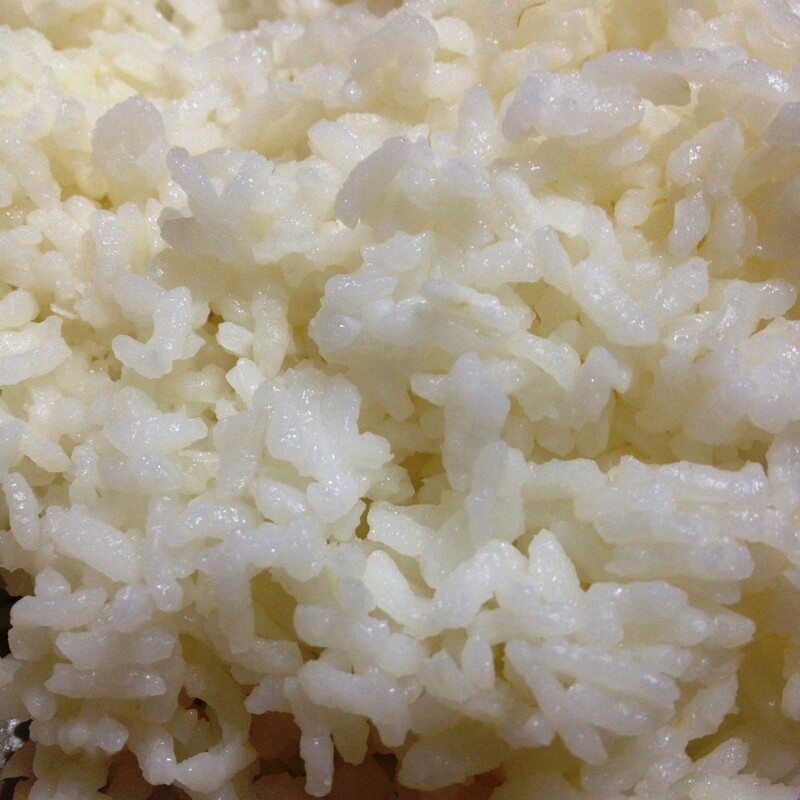 Just a little of the crab fat, stained on this rice… is gastronomic heaven. 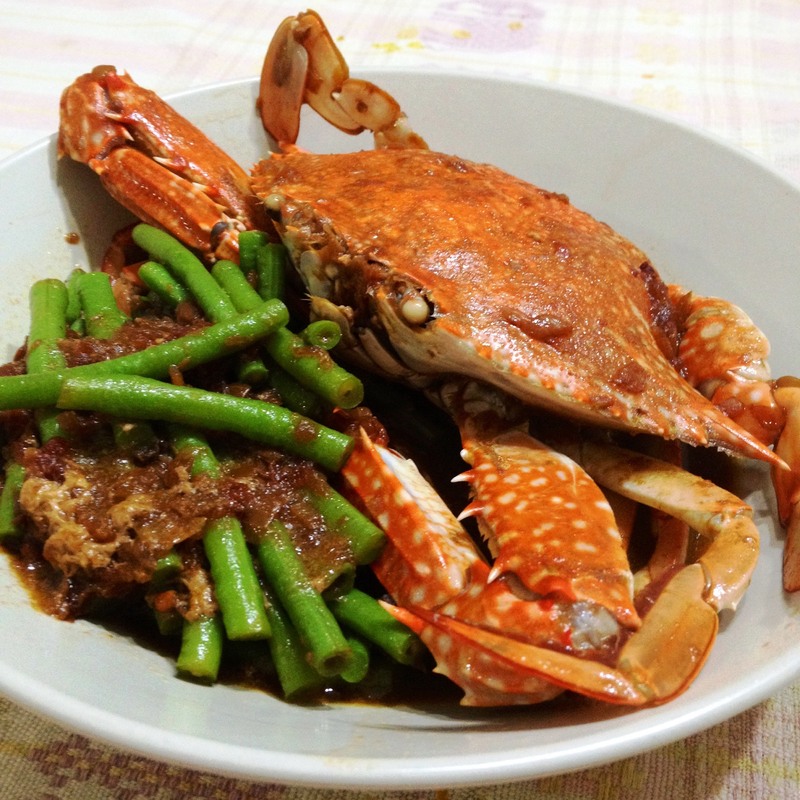 Crab and green beans – It looks so good I am ready to eat.